The regular season is over! Thanks to all the teams who participated! Now it's on to the playoffs! 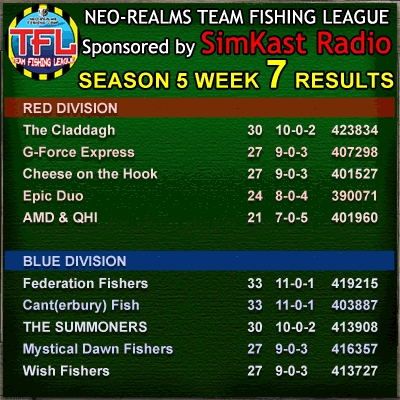 The playoffs will feature Red Champions The Claddagh vs the Blue Runner-ups Cant(erbury) Fish, and the Blue Champions Federation Fishers will play the Red Runner-ups G-Force Express. Good luck to the finalists playing this week! New TFL Players: your TFL Achievement Badges are ready! Just update your hat to receive the badge.